SONGWRITER HAL DAVID HONORED WITH A STAR IN CELEBRATION OF HIS GREAT CAREER AND 90th BIRTHDAY! 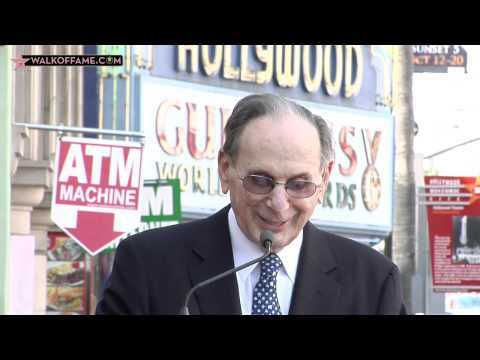 The Hollywood Chamber of Commerce honored song writer Hal David with a star on the Hollywood Walk of Fame on Friday, October 14, 2011 in front of The Musicians Institute at 6752 Hollywood Boulevard. In celebration of his star in the Recording Category, Hal David was honored with a musical tribute entitled “Love Sweet Love” in celebration of his 90th birthday, on Monday, October 17th at the Mark Taper Forum benefitting The Blue Ribbon of the Music Center and The ASCAP Foundation. "Raindrops Keep Fallin’ on my Head", "This Guy’s in Love With You" and "I'll Never Fall in Love Again" are just three of the hits in a string of standards written by Academy Award-winning lyricist Hal David. "Raindrops", which was in the movie Butch Cassidy and the Sundance Kid, garnered an Oscar®; “Don’t Make Me Over”, “Close to You” and “Walk on By” are all in the Grammy Hall of Fame. "What The World Needs Now is Love” was proclaimed “The Towering Song” by the Songwriters Hall of Fame in 2004, distinguished by its unforgettable melody and prayerful plain-spoken words that sound utterly contemporary today when conflict is so wide-spread around the world, even though it was written in 1965. In addition, "What's New Pussycat", "Alfie" and "The Look of Love" received Oscar nominations. Amongst Hal David's million-sellers, all of which have become Pop standards, are "Do You Know the Way to San Jose", "Walk on By", "What The World Needs Now is Love", “I Say a Little Prayer”, “(There’s) Always Something There to Remind Me”, “One Less Bell To Answer” and “To All The Girls I’ve Loved Before”. When Dionne Warwick recorded Hal David’s hit song “What the World Needs Now Is Love”, she commented that she felt it “should be the new national anthem”. Small wonder that Hal David has been honored for his way with words with every major award bestowed by the music industry, including 20 gold records, several Grammys, the NARM Presidential Award and the B'Nai B'rith Creative Achievement Award. He has also been elected to the Songwriter’s Hall of Fame and has been presented with their coveted Johnny Mercer Award. David garnered the prestigious Grammy Trustees Award by the National Academy of Recording Arts and Sciences. Hal David received the esteemed Ivor Novello Award from the British Performing Rights Society (the first non-British person to ever receive that award). In addition, David wrote the lyrics for film scores toAlfie, What's New Pussycat, Casino Royale, The April Fools, A House is not a Home, The Man Who Shot Liberty Valance andMoonraker. Hal David has been elected to the Nashville Songwriters Hall of Fame for his many country hits, including “To All The Girls I’ve Loved Before”, which garnered a Top country Hit of the Year Award when the famed country singer Willie Nelson duetted with the Latin star Julio Iglesias to record the hugely successful song. Lincoln College bestowed a Doctor of Music degree on David for his major contribution to American music, and he also received an Honorary Doctorate of Humane Letters Degree from Claremont Graduate University. In October of 2007 he received an Honorary Degree from the Five Towns College in Long Island, and in addition, they named their new Music Library building "The Hal David Music Library". Hal David, Burt Bacharach and Dionne Warwick are the proud recipients of the prestigious “New York Heroes Award” from the National Recording Academy. Just recently, Mr. David received the “Golden Plate” Award from the Academy of Achievement in Washington, D.C.
He’s listed as a “Distinguished Patron of the Arts” of the Los Angeles Music Center and serves as a member of the Board of Governors of Cedars Sinai Medical Center, as well as the Board of Directors of ASCAP, having formerly served as its President. Hal David is Chairman Emeritus of the Songwriters Hall of Fame and was recently awarded their first-ever Visionary Leadership Award.